Let’s have a look at crash test results again shall we. These tests were done by the American Insurance Institute For Highway Safety (IIHS), an independent, nonprofit, scientific and educational organization dedicated to reducing the losses from crashes in the US. 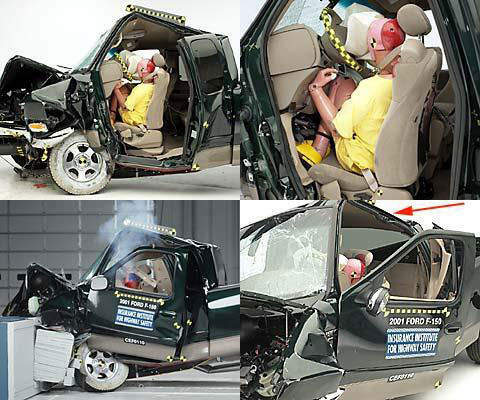 Let’s have a look at crash test results for two very different vehicles – a 2002 designed Mini Cooper and a 1997 designed Ford F-150 large pickup, which has not been redesigned until recently last year. The 2002 Mini Cooper – a small car running an inline-4 cylinder 1.6 litre engine. Weighs about 1132 kgs. The Ford F-150 is about 2029kgs. It’s in the large pickup class, which is about nowhere available here in Malaysia, though I’ve heard the Fire and Rescue department purchased some to modify as fire trucks. Powered by a 4.6 litre V8 engine. Pretty good results – kudos to BMW. These tests are done at 40 mph I think, which is about 64km/h. Restraints/dummy kinematics â€” Dummy movement was reasonably well controlled. During rebound, the dummy’s head leaned partway out the open side window. Injury measures â€” Measures taken from the dummy indicate a low risk of any significant injuries in a crash of this severity. The Mini Cooper got a ‘best pick’ award from the institute and scored an overall good result. Structure, head/neck protection, chest protection, left foot and right foot protection all scored good, and dummy kinematics (how much you get flung around during the crash) scored an average. Likely because during the kinematics test, the dummy’s left forearm hit the dummy’s head during the rebound. The Ford F-150 is a different story altogether. As you can see, the central safety cell is totally screwed. 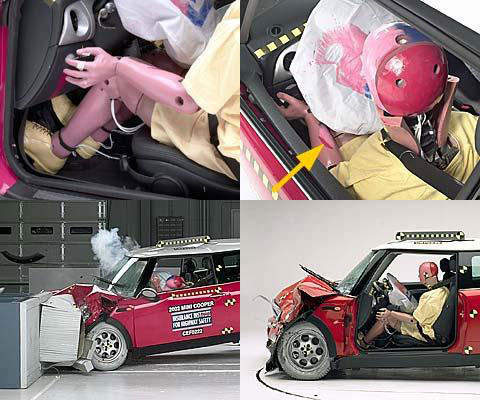 Look at how the crash test dummy is sandwiched inside between the dashboard and the seat. Restraints/dummy kinematics â€” Dummy movement wasn’t well controlled. The airbag deployed too late, and there was too much rearward and far too much upward steering wheel movement, which contributed to the dummy’s head bottoming out the airbag and hitting the steering wheel. 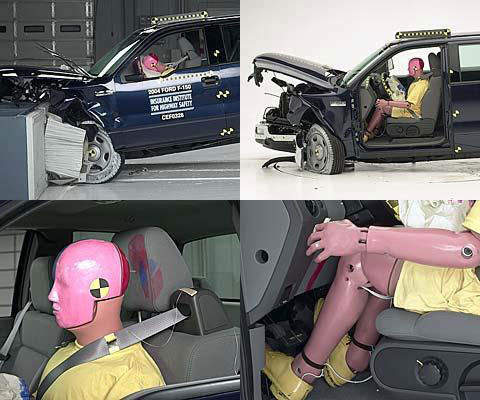 The driver seat was tilted so far forward that the dummy’s head was confined to a narrow space between the steering wheel and head restraint during much of the crash. Injury measures â€” Measures taken from the chest indicate low risk of injuries to this body region in a crash of this severity. Forces on the head and neck indicate that injuries to the neck would be likely and injuries to the head would be possible. Forces on both tibias indicate that injuries to the lower legs would be possible. Overall score was poor. With the breakdown – structure poor, head/neck poor, chest good, left foot average, right foot marginal, and dummy kinematics poor. Shows the huge different in crash engineering for the two vehicles. Like the Jiangling Landwind, I’m sure you expected the Ford F-150 to do better than this. This particular Ford F-150 model has been on the roads for 7 years before Ford updated the design in 2004 with better safety features. The new 2004 model Ford F-150 scored good for all aspects, including the dummy kinematics test which the Mini Cooper only managed to get an average. It even won a best pick award. Amazing what some re-engineering can do!